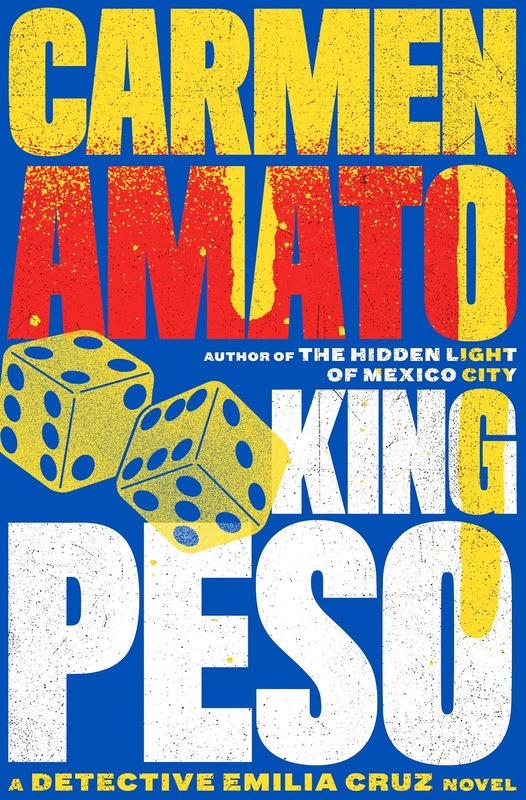 Goddess Fish Promotions has organized a Virtual Book Tour for KING PESO by Carmen Amato, a police procedural mystery available now from KDP Amazon. KING PESO is the fourth book in the sensational Detective Emilia Cruz mystery series recently optioned for both television and film. Emilia is the first female police detective in Acapulco, where Mexican drug cartels battle for control and politicians are bought with blood money. Three cops are murdered, execution style. Emilia worked with them all. Her partner’s wife is killed in a home invasion. Was he the real target? She hopes to be assigned to a task force to investigate the killings, but is instead directed to a new police unit championed by Acapulco’s ambitious mayor and overseen by a shady union strongman. But when Emilia stumbles upon a falsified report, she will conduct a private investigation, even as another murder victim carries a stark message for her. Home is no refuge for Emilia; hotel manager Kurt Rucker has a shocking secret that could tear their relationship apart. Unexpected help comes from a frightened attorney and a famous movie star, but each new clue to the murders unravels the one before. Meanwhile, Emilia’s ongoing hunt for a missing girl, a continuing series subplot, leads to the infamous El Pharaoh casino, a place she knows only too well. What do a casino and a cop killer have in common? Emilia bets on her partner, but his gamble could cost both their lives. Duarte Ochoa laughed and snapped his fingers. Out of nowhere, a young man in a King Tut costume appeared. He opened a small wooden box and offered it to the casino owner. Duarte Ochoa took out a blue chip embossed with the golden logo of the casino. Five thousand pesos. Nearly a month’s salary for Emilia. Double that for Natividad. Emilia’s gaze travelled from the chip to King Tut. Despite the costume, which included a jeweled headdress covering his forehead, she recognized Felipe Garcia. The long hair flowed over his bare shoulders and the high cheekbones were on full display. The sporting goods store wasn’t doing so well after all. It was too bad that Felipe had to moonlight at the El Pharaoh. She certainly wasn’t picking Obregon’s favorite color. “Red,” she said. Duarte Ochoa put the chip on the felted table. The croupier announced that bets were closed and spun the wheel. The clatter of the ball bouncing inside the wheel was louder than the grinding pop music. “Red wins,” the croupier announced. Duarte Ochoa smiled broadly as the croupier raked a combination of colored chips to his designated spot on the table. “Do we let it ride, Detective?” he asked Emilia. Obregon lounged against the table, watching her with that hawkish expression on his face that always made her so nervous. If he suddenly sprouted wings and talons, Emilia would not be surprised. “It’s your money,” she said. Duarte Ochoa let it ride. “Red wins,” the croupier announced again. Another bet was placed, the wheel spun, and Duarte Ochoa won a third time. The pile in front of him grew. Emilia counted at least a dozen blue chips and an equal amount of red and yellow. A year’s salary. Natividad dug her fingers into Emilia’s arm. The wheel spun again, the ball bouncing and clattering until finally settling into a numbered slot. “Black wins,” the croupier announced. First thanks for having me and introducing your readers to the Detective Emilia Cruz mystery series. As the first female police detective in Acapulco, Emilia is up against not only the drug cartels but Mexico’s culture of machismo. But as I always say, she can take the heat. KING PESO is the 4th mystery in the Detective Emilia Cruz series. There’s a cop killer on the loose in Acapulco and Emilia has worked with all of the victims. So is she next? But as usual in the Detective Emilia Cruz series, nothing is what it seems. The Detective Emilia Cruz series is for those who love fast-moving police procedural mysteries. The books are authentic to both the genre and contemporary Mexico. Expect tough language, a street view of crime, and a sprinkling of Spanish words and Mexican food. The books are not cozy mysteries. Tell us a little bit about your cover art. Who designed it? Why did you go with that particular design? The covers for the Detective Emilia Cruz series, including KING PESO, are by Washington DC-based artist and illustrator Matt Chase. They are bold, colorful, and unique, and have garnered a lot of attention. I stumbled upon Matt’s artwork on a graphic design website, found his own website and immediately saw the fresh, edgy vibe I was looking for. When Matt and I first discussed the concept, I told him I wanted the sun-drenched colors of Mexico and sent him pictures of Mexican cities filled with colorful stucco houses. The covers of most mystery novels have dark, moody colors. I wanted the series to stand out and reflect Mexico without looking cliché. He came up with the overall concept and each cover is a riff on it. We discuss every cover in detail. Matt is sensational to work with and gave the series a distinct style. Emilia is certainly my favorite character because she’s a very vulnerable woman in a pressure-cooker environment. She’s a survivor but her survival is never a sure thing. She’s grown tough both because of her family situation and because of the job, but there are times when she wants to have someone else shield her from all the crap she sees on the streets every day. Many readers tell me they love the scenes when she argues with Franco Silvio, the surly senior detective who became her partner in the second book in the series, HAT DANCE. He never wanted a female partner; in fact he once vowed to destroy her. By the time we get to KING PESO, the 4th book, they have a relationship of grudging respect. But when his wife is murdered, Emilia’s partnership with him goes into a tailspin. I love to write scenes with Victor Obregon Sosa, head of the police union for the state of Guerrero. He’s a deliciously gray character who is a dirty cop but so clever no one can prove it. He’s corrupt and for that reason is in the Least Favorite character. The scenes between him and Emilia are often charged with sexual tension and can be very challenging to write. I began the Detective Emilia Cruz series after being confronted with an armed drug addict on Christmas Eve a few years ago. My family lived in Mexico City and we were attending the midnight Mass in our Catholic church when the ceremony was disrupted by a man who came in shouting incoherently and waving a gun. We were all shocked to see him make his way up the center aisle and accost our pastor, Father Richard. Without skipping a beat, Father Richard found a few pesos and gave them to the man, who settled down. Parishioners came forward, took away the gun, and escorted the addict out of the church. Mass went on. The incident made me realize how close Mexico’s drug war was to all of us and I wanted to show what is going on but also to offer hope for better times. That’s how the first female police detective in Acapulco came to be. Emilia Cruz is taking on murder, mayhem, and Mexico’s culture of machismo in one of the most beautiful and deadly places in the world. If you like international police procedural novels by Ian Rankin (the John Rebus series), Jo Nesbo (the Harry Hole series), or Henning Mankell (the Wallander series) you’ll want to meet Emilia Cruz. Like books by these authors, the Detective Emilia Cruz series is driven by personal relationships and motivations and to a much lesser extend, depend on forensics or technology. The vibe of this genre is dark and edgy, with plots embedded in greed and power. Every reader who subscribes to my Mystery Ahead newsletter gets a free copy of the Detective Emilia Cruz Starter Library. The Starter Library features “The Beast,” the story about how Emilia became the first female detective in Acapulco, which was first published in The Huffington Post. You’ll also get “The Angler,” the story based on a real life murder mystery, plus the first chapters of the first three Emilia Cruz novels. You can click here to be taken to the Starter Library page. Thanks so much for having me and happy reading! Follow her on Twitter @CarmenConnects. Carmen Amato will be awarding a $50 Amazon or Barnes and Noble GC to a randomly drawn winner via rafflecopter during the tour. Enjoyed the excerpt and interview, sounds like a great book, have a wonderful holiday season!